I-CAR last week and again Thursday put to bed the idea that recycled outer quarter panels with rolled hem flanges could be used. 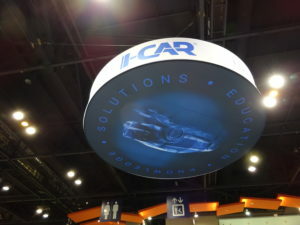 “This is a huge problem in our shops across the country,” Collision Hub CEO Kristen Felder said Thursday while discussing the June 21 I-CAR best practice statement with I-CAR industry technical relations director Jason Bartanen at NACE. Shops were being asked to install recycled quarter panels “every day,” she said. “You wouldn’t put a recycled door skin on,” Bartanen agreed — the same logic applied to outer quarter panels with rolled hem flanges. While it might not be as much of a safety issue as a workmanship and quality issue, it still shouldn’t happen, he said. Felder pointed out that a vehicle was likely the second most expensive item the shop’s customer owned. “They deserve our best on their piece of property,” she said. Bartanen said that the document stemmed from a May I-CAR repairability summit. Society of Collision Repair Specialists Vice Chairman and A&B CARSTAR owner Brett Bailey was particularly outspoken about the practice, according to Bartanen. “Outer quarter panels with rolled hem flanges are not candidates for recycled part usage,” I-CAR wrote July 21. “This is due to the removal process required; alternate removal methods will result in a work-hardened flange that may fail. “Outer quarter panels with rolled hem flanges are formed by applying adhesive and folding the edge of the outer quarter panel over itself and the inner quarter panel, “clamping” the inner panel into the fold. These quarter panels are attached the same way that a door skin is attached to the door shell; which means that for removal, the edge of the hem flange is ground off. “Rolled hem flanges cannot be straightened to release the inner panel, in order to reuse the outer quarter panel. This is due to work hardening of the bend radius, the damage that is caused to the outer quarter panel, and the recommended removal method. 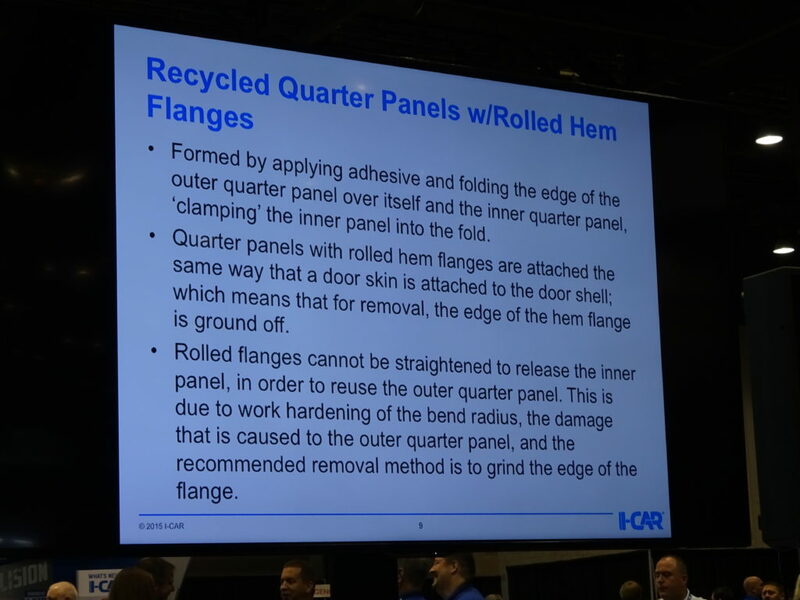 Bartanen said that while General Motors did have a technical support bulletin regarding applying corrosion protection under the hem flange, “we’re not opening up the entire hem flange” as would occur during the recycled outer quarter panel practice I-CAR condemned. Bartanen clarified Monday that the “best practice only applies to outer quarter panels featuring rolled hem flanges, and does not address recycled quarter panel assemblies.” The word “outer” was omitted during an earlier version of the document, leading to confusion.